Returning to Cold Creek, Ohio, is an act of courage for Tess Lockwood. Abducted and held captive as a young girl, she is unable to remember anything about the crime that destroyed her childhood and tore her family apart. Now a grown woman with a bright future, she is certain she has put the past behind her. 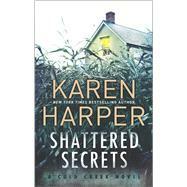 But when she inherits the family home, Tess must confront the demons that still haunt her and the town of Cold Creek. Gabe McCord has always blamed himself for what happened to Tess. He had been a teenager when she was snatched from the group of children he was responsible for watching. Now Gabe has taken on the role of sheriff and hopes to shed new light on the cold case, especially given his growing feelings for Tess.